Julienne is part of a Right To Play leadership club of 125 members, who range in age from 8 to 14. She created the Let Girls Go Back to School campaign to “show how education is vital to a secure future” in a region where thousands of children do not have access to it. For many, this is because they are forced to work in dangerous conditions to supplement their family’s incomes. Julienne and her team accomplished all this by going door to door and engaging with parents of absentee children and calling on influential community figures to help reinforce their message. They also performed inspiring public theatre skits that focused on children’s rights and how an education is a powerful tool to combat child labour. Julienne is the perfect example of the power of play’s ability to protect, educate and empower children. 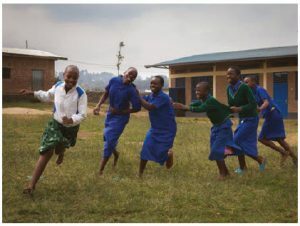 Right To Play believes play is one of the most powerful and fundamental forces in a child’s life and the organization harnesses it to help 1.9 million children each week to stay in school and out of work. It also works to prevent life-threatening diseases such as HIV and malaria and to keep children safe from exploitation and abuse. Right To Play was established in 2000 and is already planning for its 20th anniversary next year. The idea for the organization stretches back to 1994, when Norwegian speed skater Johann Olav Koss visited the newly formed African country of Eritrea as an ambassador of Olympic Aid (which later became Right To Play) on a humanitarian trip. Koss witnessed the effects of a country rebuilding after decades of conflict. But amongst the wreckage of war, children were still running and playing. One boy in particular caught Koss’ eye. When asked why he was so popular, the children replied it was because he owned a long-sleeved shirt that they could roll up and tie into a ball to play soccer. Right To Play is the only global development organization focused exclusively on using play to transform the lives of children and youth affected by poverty, war, disease and inequality. It does this in 15 places (Mali, Uganda, Pakistan, Jordan, Rwanda, Tanzania, Thailand, Canada, Lebanon, Mozambique, China, Ethiopia, the Palestinian Territories, Burundi and Ghana) through five pillars: quality education, gender equality, health and well-being, child protection and peaceful communities. For children such as the boy in Eritrea or Julienne in Rwanda, the organization has helped them find their way back to hope. It has unlocked their potential and allowed them to envision a brighter future for themselves. Julienne’s efforts are opening doors to big dreams. “Our club taught me to look after myself, my friends and others. Now I want to be a doctor, because I enjoy helping people.” Julienne’s mission will continue to help many communities by dismantling barriers and empowering other children to discover their own potential. Rebecca Cuthbert is the communications co-ordinator for Right To Play Canada.